About the Exhibit: This exhibit will run June 1 – August 31, 2010. 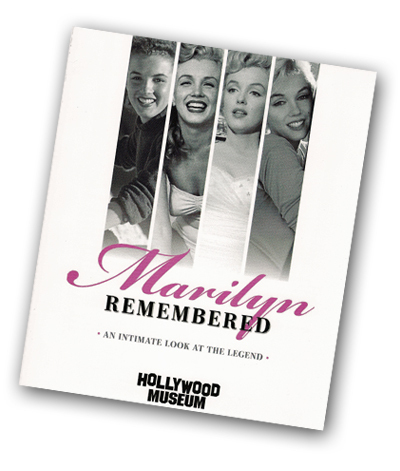 Over 200 personal and professional items from the life and career of Marilyn Monroe will be showcased at The Hollywood Museum, which is located in the historic Max Factor building in Hollywood, California. Marilyn Monroe Photography: Original photographs of Marilyn Monroe taken by world famous photographers Andre DeDienes, George Barris and Milton Greene. Marilyn Monroe Owned Property: Items from six individual collectors will be on display, including selections from the Scott Fortner Collection and the Greg Schreiner Collection. Marilyn Monroe’s personal shoes, worn when she married Joe DiMaggio and also when performing for the troops in Korea in 1954. The vibrant green Pucci blouse that Marilyn was wearing when the last ever photos of her were taken less than a week before she died. Marilyn’s beaver fur coat, gifted to her by Arthur Miller. Several gowns worn by Marilyn in numerous studio publicity photographs and publications. Clothing items from Marilyn Monroe’s personal wardrobe, including evening and cocktail attire, casual wear, and furs from her private collection, including the very first fur she ever owned. Marilyn Monroe’s personal film scripts for “Niagara,” “There’s No Business Like Show Business,” and “How To Marry A Millionaire” among others. Personal accessories, household goods, makeup & cosmetics, books from her home library and furniture from her final residence in Brentwood, California. Numerous personal documents, including a Screen Actors Guild membership card, bank statements and receipts, bills and invoices outlining in great detail the personal and very private life of Marilyn Monroe. View and purchase the official exhibit catalog here. The TODAY show from Australia. Click here for the news report. Exhibit Artwork by Sergio Serrano.